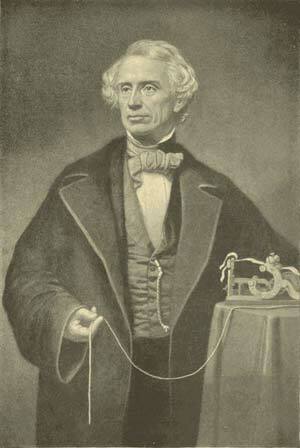 Samuel Finley Breese Morse, artist and inventor, was born at the foot of Breed's Hill, Charlestown, Mass., on April 27, 1791. His father was the Rev. 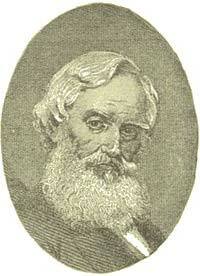 Jedediah Morse, D.D., the author of Morse's "Geography." At the age of fourteen Samuel Morse entered Yale College; under the instruction of Professors Day and Silliman he received the first impulse toward those electrical studies with which his name is mainly identified. In 1811 Morse, whose tastes during his early years led him more strongly toward art than toward science, became the pupil of Washington Allston, then the greatest of American artists, and accompanied his master to England, where he remained four years. His success at this period was considerable; but on his return to America, in 1815, he failed to obtain commissions for historical paintings, and after working on portraits for two years at Charleston, S.C., he removed first to Washington and afterward to Albany, finally settling in New York. In 1825 he laid the foundations of the National Academy of Design, and was elected its first president, an office which he filled until 1845. The year 1827 marks the revival of Morse's interest in electricity. It was at this time that he learned from Professor J. F. Dana, of Columbia College, the elementary facts of electro-magnetism. As yet, however, he was devoted to his art, and in 1829 he again went to Europe to study the old masters. The year of his return, 1832, may be said to close the period of his artistic, and to open that of his scientific, life. On board the packet-ship Sully, which sailed from Havre, October 1, 1832, while discussing one day with his fellow-passengers the properties of the electro-magnet, he was led to remark: "If the presence of electricity can be made visible in any part of the circuit, I see no reason why intelligence may not be transmitted by electricity." It was not a novel proposition, but the process of formulating it started in his mind a train of new and momentous ideas. The current of electricity, he knew, would pass instantaneously any distance along a wire; and if it were interrupted a spark would appear. It now occurred to him that the spark might represent a part of speech, either a letter or a number; the absence of the spark, another part; and the duration of its absence, or of the spark itself, a third; so that an alphabet might be easily formed, and words indicated. In a few days he had completed rough drafts of the necessary apparatus, which he displayed to his fellow-passengers. Five years later, the captain of the ship identified under oath Morse's completed instrument with that which Morse had explained on board the Sully, in 1832. During the twelve years that followed Morse was engaged in a painful struggle to perfect his invention and secure for it a proper presentation to the public. The refusal of the Government to commission him to paint one of the great historical pictures in the rotunda of the Capitol, seemed to destroy all his old artistic ambition. In poverty he pursued his new enterprise, making his own models, moulds, and castings, denying himself the common necessaries of life, and encountering embarrassments and delays of the most disheartening kind. It was not until 1836 that he completed any apparatus that would work, his original idea having been supplemented by his discovery, in 1835, of the "relay," by means of which the electric current might be reinforced or renewed where it became weak through distance from its source. Finally, on September 2, 1837, the instrument was exhibited to a few friends at his room in the University building, New York, where a circuit of 1,700 feet of copper wire had been set up, with such satisfactory results as to awaken the practical interest of the Messrs. Vail, iron and brass workers in New Jersey, who thenceforth became associated with Morse in his undertaking. Morse's petition for a patent was dated September 28, 1837, and was soon followed by a petition to Congress for an appropriation to defray the expense of subjecting the telegraph to actual experiment over a length sufficient to establish its feasibility and demonstrate its value. The Committee on Commerce, to whom the petition was referred, reported favorably. Congress, however, adjourned without making the appropriation, and meanwhile Morse sailed for Europe to take out patents there. The trip was not a success. In England his application was refused, on the alleged ground that his invention had been already published; and while he obtained a patent in France, it was subsequently appropriated by the French Government without compensation to himself. His negotiations also with Russia proved futile, and after a year's absence he returned to New York. On February 23, 1843, Congress passed the long-delayed appropriation of $30,000; and steps were at once taken to construct a telegraph from Baltimore to Washington. On May 24, 1844, it was used for the first time, Mr. Morse himself sending over the wires the first and ever-to-be-remembered message, "What hath God wrought." Morse's parents were already secured to him and his associates, and companies were soon formed for the erection of telegraph lines all over the United States. In the year 1847 he was compelled to defend his invention in the courts, and successfully vindicated his claims to be called the original inventor of the electro-magnetic recording telegraph. Thenceforward Morse's life was spent in witnessing the growth of his enterprise, and in gathering the honors which an appreciative public bestowed upon him. As years went by he received from the various foreign governments their highest distinctions, while in 1858 the representatives of Austria, Belgium, France, the Netherlands, Piedmont, Russia, the Holy See, Sweden, Tuscany, and Turkey appropriated the sum of 400,000 francs in recognition of the use of his instruments in those countries. The telegraph is not the only great success with which the name of Samuel Morse is honorably connected. Having made the acquaintance of Daguerre in Paris, he studied with him the infancy of photography, and was the first to take sun pictures, or daguerreotypes, in America. Also it was he who made the first submarine electric cable. This was laid in New York Harbor; and from it he was the first to conceive that stupendous idea of the transoceanic telegraph. In the preparations for laying the first Atlantic cable he took an active part, though the attempt of 1857, in which he personally engaged, was not successful. He died April 2, 1872, at New York, where his statue in bronze now stands in the Central Park.